Betadine Antiseptic First Aid Cream (20g) Betadine Antiseptic First Aid Cream is recommended for grazes, minor burns and scalds and the treatment of minor infections. Directions for useWash wound with clean running water.Clean with disposable sterile swabs.Using sterile gauze, dry the wound first, followed by the surrounding skin.When the wound has stopped bleeding, apply the appropriate Betadine product to the wound and to the surrounding skin.Cover wound with appropriate size dressing if friction with clothing or further injury is likely.Secure dressing with conforming cotton bandage, fastened with safety pin or adhesive tape. 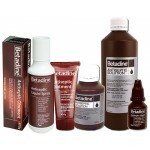 ..
Betadine Antiseptic Liquid Hospital 500mlBetadine Antiseptic Liquid rapidly kills all bacteria and fungi commonly responsible for wound and minor skin infections.DirectionsApply undiluted to the injured area two to three times daily or as required.WarningsDo not use if hypersensitive to iodine if irritation redness or swelling develops discontinue treatmentDo Not use on or near the eyesDo not mix with detergents or other chemicalsFor external use onlyStorageStore below 25c..
Betadine Antiseptic Liquid Spray 75mLBetadine Antiseptic Liquid rapidly kills bacteria and fungi commonly responsible for wound and skin infections. This spray pack makes application convenient and not messy.DirectionsHold bottle about 25cm from skin. Press valve firmly with index finger and spray from an angle to cover desired area. Allow to dry. Area may be covered with a secondary dressing and bandaged if desired. Replace cap after use. If actuator clogs, remove and soak in warm water.WarningsDo not use if hypersensitive to iodine or povidone. If irritation, redness or swelling develops, discontinue treatment and consult a doctor. Not recommended during pregnancy or breastfeeding. Do not mix with detergents or other chemicals. ..